Craig Watkins, Reader, Department of Town and Regional Planning, University of Sheffield. Part 1: THE POLICY CONTEXT - Introduction; The changing context of housing development; The sustainability of new housing development; The residential planning process;. Part 2: MARKET, ECONOMIC AND POLITICAL CONTEXT - The speculative housebuilding industry; The politics of planning and housing development;. "We welcome the government's proposed increase in the quantities of affordable housing, but would echo the findings of Greenfields, Brownfields and Housing Development in urging ministers to look closely at how solutions to housing shortages can become catalysts for increased local prosperity and improved quality of life". 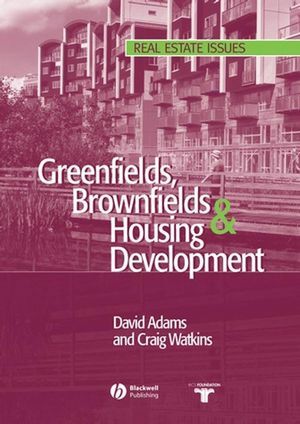 'This book provides the reader with a very sound understanding of the way in which house builders, planners and all those with an interest in development are accommodating policy change since the mid 1990s. It draws on a wealth of research experience and provides a very useful mix of material....an important milestone' Journal of Housing and the Built Environment.